And yet another Cressard study, this time on the Neolithic of North-Central Arabia Peninsula. 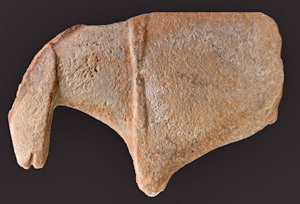 Pre-Pottery Neolithic assemblages are best known from the fertile areas of the Mediterranean Levant. The archaeological site of Jebel Qattar 101 (JQ-101), at Jubbah in the southern part of the Nefud Desert of northern Saudi Arabia, contains a large collection of stone tools, adjacent to an Early Holocene palaeolake. The stone tool assemblage contains lithic types, including El-Khiam and Helwan projectile points, which are similar to those recorded in Pre-Pottery Neolithic A and Pre-Pottery Neolithic B assemblages in the Fertile Crescent. Jebel Qattar lies ~500 kilometres outside the previously identified geographic range of Pre-Pottery Neolithic cultures. Technological analysis of the typologically diagnostic Jebel Qattar 101 projectile points indicates a unique strategy to manufacture the final forms, thereby raising the possibility of either direct migration of Levantine groups or the acculturation of mobile communities in Arabia. The discovery of the Early Holocene site of Jebel Qattar suggests that our view of the geographic distribution and character of Pre-Pottery Neolithic cultures may be in need of revision. green; after Aurenche and Kozlowski . The JQ-101 site is located in the southern part of the Nefud Desert in Saudi Arabia. Critically the Jebel Qattar site includes characteristic fossils: the El Khiam and Heluwan points, that link it clearly to the Southern Levant (i.e. Palestine and Jordan). This may relate this colonization with proto-Semitic or very early Semitic peoples, which are often suspected to be related to these cultures. In particular I wonder if these peoples may have been already carrying the seed of the Southern Semitic languages which once extended through Southern Arabia and parts of The Horn of Africa (now restricted mostly to Eritrea and Ethiopia, although still surviving among the Mehri and Socotran). Another study also by Cressard researches two greatly different periods of occupation of what was once a lake in Southern Saudi Arabia, not far from Yemen. The Arabian Peninsula is a key region for understanding climate change and human occupation history in a marginal environment. The Mundafan palaeolake is situated in southern Saudi Arabia, in the Rub’ al-Khali (the ‘Empty Quarter’), the world’s largest sand desert. Here we report the first discoveries of Middle Palaeolithic and Neolithic archaeological sites in association with the palaeolake. We associate the human occupations with new geochronological data, and suggest the archaeological sites date to the wet periods of Marine Isotope Stage 5 and the Early Holocene. The archaeological sites indicate that humans repeatedly penetrated the ameliorated environments of the Rub’ al-Khali. The sites probably represent short-term occupations, with the Neolithic sites focused on hunting, as indicated by points and weaponry. 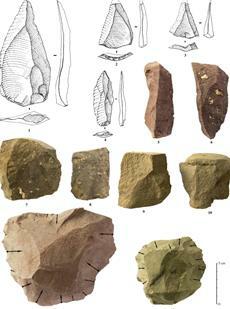 Middle Palaeolithic assemblages at Mundafan support a lacustrine adaptive focus in Arabia. Provenancing of obsidian artifacts indicates that Neolithic groups at Mundafan had a wide wandering range, with transport of artifacts from distant sources. Figure 5. General views of the Mundafan palaeolake. Again the content is rich in details of great interest for the archaeologist and prehistorian but surely a bit harder to digest for the casual aficionado. Of interest anyhow is that no Nubian Complex affinities have been observed in the Middle Paleolithic tools and cores, suggesting again that the colonization of Arabia and Palestine from Africa was multifaceted, with different and sometimes ill-defined cultural sources. The Mundafan Neolithic sites do not appear to be sedentary locations on the basis of the absence of architectural features, grindstones, domesticated faunal remains, and relatively low artifact densities. The prevalence of projectiles and other weaponry is probable evidence of hunting activities. Mundafan would have been a favorable setting for short-term hunting along the lakeshore. The presence of rare obsidian artifacts demonstrates Mundafan’s participation in long-distance mobility systems that included relations with the obsidian-rich mountainous zones of Yemen, some 400–500 km away from the site. While the term “Neolithic” is used in the paper, the kind of economy that the people living there had seems to have been hunter-gatherer. the proposed reduction succession discussed in the text. type 2 and yellow type 1/2. The authors argue that Southern and Central Arabia are the Easternmost reaches of this complex, however we cannot forget that the recent discovery of Indian sites with a complex industry, dated to c. 96 Ka ago, of Nubian, Aterian and other MSA affinities challenges this notion. … and in general the categories MSA and out of Africa. This is not about the L(xM,N) lineages but about the Eurasian ones like R0a or R2. This paper provides a broad overview of the current state of archaeogenetic research in Arabia. We summarise recent studies of mitochondrial DNA and lactase persistence allele -13915*G in order to reconstruct the population histories of modern Arabs. These data, in turn, enable us to assess different scenarios for the peopling of the Peninsula over the course of the Late Pleistocene and Early Holocene. The evidence supports the posited existence of Arabian refugia, although it is inconclusive which (e.g. 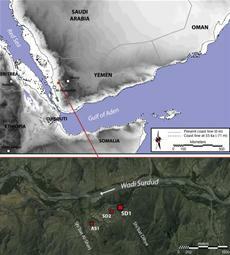 Persian Gulf basin, Yemeni highlands and/or Red Sea basin) was/were responsible for housing ancestral populations during the Last Glacial Maximum. Synthesising genetic and archaeological data sets, we conclude that a substantial portion of the present South Arabian gene pool derives from a deeply rooted population that underwent significant internal growth within Arabia some 12,000 years ago. At the same time, we interpret the disappearance of Nejd Leptolithic archaeological sites in southern Arabia around 8000 years ago to represent the termination of a significant component of the Pleistocene gene pool. Rose uploaded the full paper at Academia.edu. Very much worth a careful read because it is a rare case of paleogenetics being done by a researcher who is primarily an archaeologist and who knows well the material Prehistory of which he’s talking about, at all moments seeking to reconcile archaeological and genetic evidence and not, as way too often happens, creating genetic-only models with absolutely no material foundations and unavoidably clashing with prehistoric reality. The Al-Magar culture, dated to c. 5500-3500 BCE, belongs to a period more humid than today. It has some very beautiful art but, crucially, raises questions on the time and place of the first domestication of horses. Why? Because the art of the culture is full of what can be horses (wild or domestic) and other equids like the onager. Of course, equid skeletal remnants are also abundant. While the source of this news snippet is very enthusiastic about the possibility that the area may have been home to a parallel horse-domestication event, no specific evidence is provided other than the statues there being thousands of horse remains (hard to drag from hunt site if these would have been wild) and the ability of those early “Arabs” to build large sedentary settlements. Nothing conclusive… but suggestive indeed. Edited on May 25th (new text in red, removed text slashed out).